Douglas Curran and Michael Mitchell - two of Canada's leading documentary photographers - were commissioned by the Walter Phillips Gallery and the Whyte Museum to photograph Banff Park over a four week period in 1985. Doug and Micheal created a powerful and insightful document of the contemporary reality of National Parks in Canada. In a review of the exhibition at the Walter Phillips Gallery Nancy Tousley stated " ... the contemporary experiance of the wilderness is structured and controlled to maintain the myth that it is still in fact wild." This is particularly interesting considering that most serious photography done in the Parks is specifically intended to promote this wilderness myth. Their individual views of this complex subject join to form a rich understanding of Canada's relationship with wilderness. The photographs are of Banff National Park but by implication are a reflection of all of our wilderness preserves. This touring exhibition is a slightly edited version of the original exhibition and is being toured by the Whyte Museum. Organized by the Walter Phillips Gallery and toured by Whyte Museum of the Canadian Rockies, Banff, Alberta. Supported in Vancouver by the Canada Council. Accompanied by a poster with texts by Ed Cavell and Lorne Falk from the Whyte Museum of the Canadian Rockies and Michael Mitchell with selected biographies of the artists. 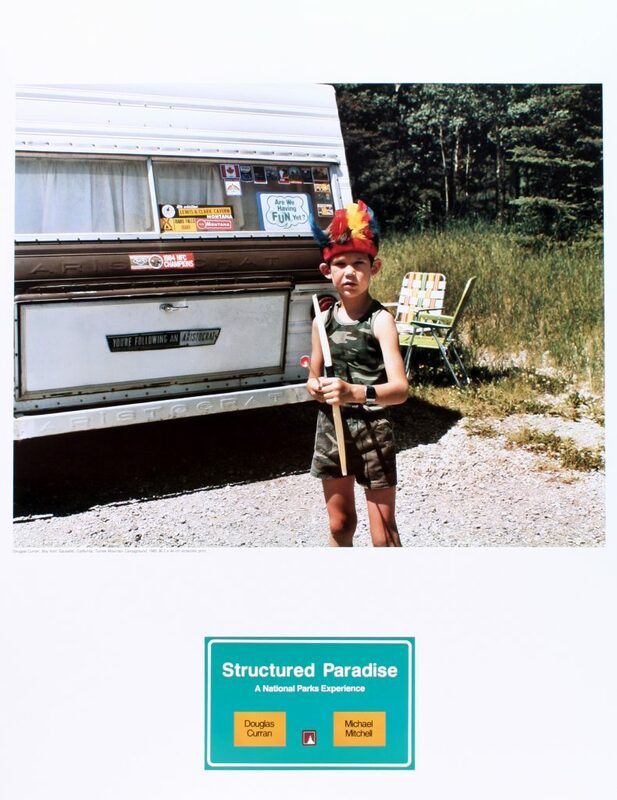 Poster for the exhibition "Structured Paradise: A National Parks Experience"